Get stroke Treatment in Yakima. Someone in the United States has a stroke every 40 seconds, according to the Centers for Disease Control and Prevention. Each year, about 795,000 Americans experience a new or recurrent stroke. About 46,000 more women than men have strokes. Strokes accounted for 1 out of 15 deaths in the U.S. (American Heart Association, Heart Disease and Stroke Statistics-2010 Update). 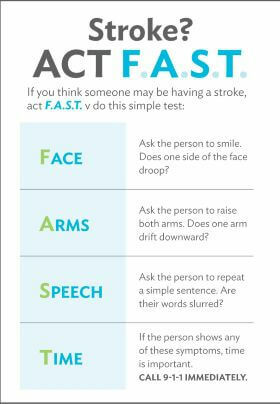 Each year about 795,000 people experience a new or recurrent stroke, making stroke the nation's third-leading cause of death. On average, someone suffers a stroke every 45 seconds and someone dies of a stroke every 3.1 minutes. Stroke is a leading cause of serious, long-term disability in the United States, with about 4.7 million stroke survivors alive today. If a stroke is caused by a blockage, and the type and location can be determined within three hours patients are often treated with a medication known as tPA (tissue plasminogen activator). This medication for many patients can dissolve clots and stop or reduce the damage from stroke. Having a timely consultation with a neurologist can help beat the clock for many people who have had a stroke. Memorial staff can access a neurologist at Virginia Mason Health System in Seattle through telemedicine-based technology; ensuring that patients receive around-the-clock access to specialists without traveling away from home. Some patients with complex stroke and other acute health-care needs may be transferred to Seattle for a higher level of care. Emergency Department at Memorial is a 25-bed unit staffed by 75 specialists who treat more than 89,000 patients a year. Memorial's TeleStroke program provides the latest in emergency stroke services by combining the medical expertise of our larger partnerl with emergency care right here in Yakima. Heart and Vascular Lab performs diagnostic and treatment services, enabling hospital staff to treat most patients who may have suffered a heart attack or stroke. Vascular Surgery Surgery of the carotid artery is performed when the major arteries in your neck become narrowed or blocked. These arteries, called the carotid arteries, supply your brain with blood. Your carotid arteries extend from your aorta in your chest to your brain. Advanced Care Unit offers 20 beds providing cardiac monitoring by a highly trained staff. Home Health Services reaches out to those who need nursing care, rehabilitation and/or therapy—all provided in the comfort of your home. Home health care is a skilled, personalized service provided to patients of all ages where they live, including assisted living or group home settings. Anticoagulation Management Services are provided for stroke patients who are prescribed blood thinning drugs such as Coumadin or Warfarin. These drugs must be closely monitored by pharmaceutical technicians to ensure patients are receiving appropriate dosages. Educational Services offers classes and courses on many diseases and medical challenges faced by our community. Many of these courses and events are free or have a nominal cost. Support Groups give support and advice to those dealing with life-changing medical and psychological conditions. Family and caregiver support groups also meet regularly.